Annotation: Summer Bridge Activities: Bridging Grades K–1 gives students a head start for their first-grade year. Review kindergarten skills such as rhyming and counting while preparing for first-grade skills such as telling time and writing complete sentences. School stops for summer, but learning never should! 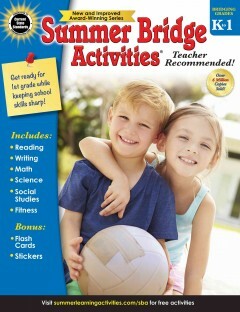 The best-selling, award-winning Summer Bridge Activities(R) series helps prevent summer learning loss while getting students ready for the school year ahead. Engaging practice activities for math and language arts skills can be completed in just 15 minutes during each weekday of summer vacation. All activities support current state standards. In addition, exclusive features help kids stay active and healthy by moving and thinking, with activities such as goal setting, character development exercises, fitness challenges, hands-on science experiments, social studies activities, and outdoor learning experiences. Bonus flash cards and an online companion are included. With 12 weeks of learning fun, Summer Bridge Activities is the perfect way to keep skills sharp all summer long!